When did your athletic career/interest in athletics begin? I’ve always been athletic in some form or fashion since elementary school. I played soccer, basketball and softball throughout my high school years. Running was my real love, but my school did not offer it at the time, so I joined programs outside of the school that did include track. I got the bug to compete in 1986 where I placed second in The Natural Eastern Classic. Later, I met, dated and eventually married former pro bodybuilder, Jim Quinn, whom I met in the gym where I worked as a personal trainer. He understood the importance of supportive nutrition and a fitness lifestyle. I think being involved in sports at such an early age, made it easy to transition to an exercise regimen that has lasted my whole life. What adversity have you had to overcome to stay physically active? I have to say I’ve been very lucky – I’ve had no major injuries to date. Personally, my twin sister suddenly passed away at just 33 years old due to health issues. This has become a major force in my drive to stay fit. After the birth of our son at the age of 42, I initially found it challenging to get back into the gym in addition to a 2 ½ hour commute each way from my job in Manhattan, but found a way to make it work. I now break up my day and use my lunch hour to work out at our local gym, with several of my co-employees instead of sitting and eating lunch. Seven years ago, Human Resources approached me and asked if I can implement a Biggest Loser contest, to help others get on the right track when it came to their own nutritional and exercise regimens. I, of course, jumped on the opportunity and have been doing it ever since. It gives me the opportunity to spread the word about nutrition and exercise which I am so passionate about. Just recently, the “Biggest Loser” winner was announced and a very nice write-up was put in my firm’s blog (see below). I am so happy to say that doing the Biggest Loser for my firm is one of the highlights of my job. A very special thanks goes to Coach Deirdre Quinn for her dedication to her team and all of her hard work over three long months. From drafting bi-weekly informational newsletters, to providing one-on-one motivation and support to the team members, to walking the stairs and taking folks to the gym, to managing weigh-ins, to collecting and analyzing weekly food tracking charts, and much more, Deirdre is the epitome of Reed Smith Core Values. She runs the program entirely for the sake of helping others. Bravo Deirdre; Reed Smith and your team thanks you! Working out has always been a way of life for me. At 52 years of age, I am continuing to make it a point to be a fit parent. I had Brady (who is now 11 years old) at 42. He now is able to take runs with me (just as my father did), and I try to stay involved in his sports activities. He sees us working out on the weekend and observes us eating healthy. I want him to inherit the same fitness lifestyle we’ve maintained throughout our lives. Another plus, is having more energy given less sleep due in large part to my regimen. What is your current work out program? How has it changed? My goodness yes, it’s changed quite a bit over the years. Back in the day: My younger years, pre-husband, pre-house, pre-kid, pre-responsibilities, I was in the gym twice a day. In the mornings I would do aerobics for an hour and in the evenings I would lift weights for an hour and a half, 6 to 7 days a week. My eating was meticulous, my bedtime regimen the same, I always made sure I was in bed by 8:00 pm. Living in Manhattan where the city never sleeps, being young and single, this was not an easy task, but I must say it kept me out of trouble. Today: We just bought a house in Pennsylvania in July. I am still commuting to and from Manhattan, five days a week, so there really is not much personal time. My lunch hour is the most convenient time for me to workout. Thank goodness, my office is fully supportive of this. I’m big on variation, knowing it’s a necessary part of an effective training program. As example: Monday I will do some sort of aerobics; whether it be a run in the park or treadmill on an incline, jumping rope for 45 minutes and the step-mill is a big must, Tuesday I will lift weights breaking up my body parts accordingly, Wednesday; aerobics again, Thursday; weights, and so on. 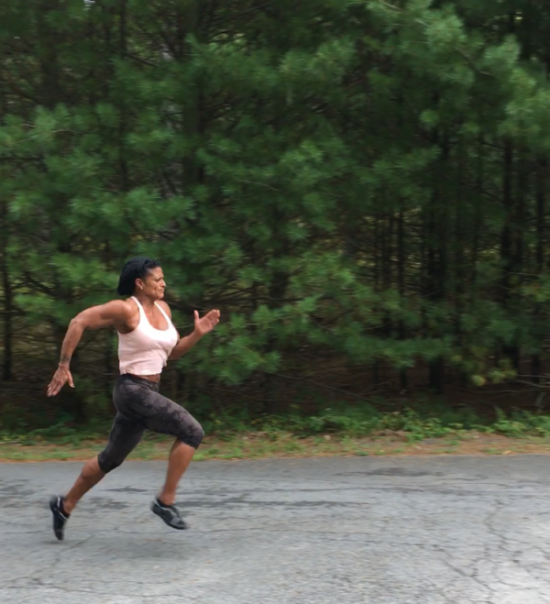 On weekends my husband, who happens to be a Strength and Conditioning Coach – (yes, agreed, very convenient – www.Quinnbodyandperformance.com), will take me and our son to the track to do sprints or I will just work out at our home gym. Funny story, this weekend my son, for the first time, was very close to beating me in sprints. I don’t know if it’s me slowing down or him getting better. Whatever the case, the day he beats me is the day I will be very proud, but I will most definitely not make it easy for him. So when someone tells me they have no time to work-out, well I think that’s all relative. If you want it to be a priority, it will be. What is your Number 1 fitness tip? Oh my goodness, good question. There are so many thoughts in my head right now, but I’d have to say the number 1 fitness tip is this: when you hit a certain age, and that age is different for everyone, you really must listen, be in-tune with, respect and know your body. I am no longer 20. I am in this for the long haul. I do what I feel I can do and do not feel bad knowing it’s not even close to what I use to do – know that it’s okay — but for that time, I will give it my all. Secondly, it’s the food. The most important part of being fit and looking better in the mirror, has most to do with what you feed your body in those other 110 hours you are up. As long as I keep my food clean and sequenced throughout the week, it doesn’t bother me as much that I occasionally miss a workout. I know you asked for one, but please, one more thing: do not hesitate to grab support from family and friends. I would not be able to sustain my health regimen without the support of my loving husband and my friends at work, who push and encourage me whenever possible. Being healthy, mind body and soul, is a must — it’s not if you’re going to start, but when! Great article! I’ve known Deidre Quinn for a little more than a decade and she is without a doubt the epitome of health, strength and endurance. She is a great motivator, friend and a very special person. I don’t believe I’ve met anyone or have known anyone with her dedication to self and others! Thanks for sharing Betsy. Much appreciated.